Spain captain Aitor Gismera and Ireland skipper Ben Curtis pictured with the officials before today's game. 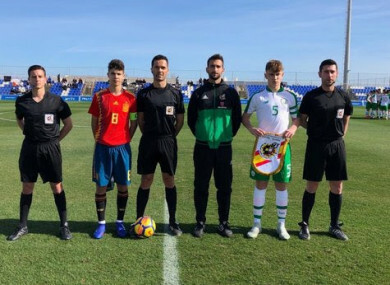 THE REPUBLIC OF Ireland U15 side played out a 1-1 draw with their Spanish counterparts today in the opening game of a four-team international tournament in Spain. While the tournament is being contested on a round-robin format, a developmental penalty shootout was held afterwards at the Pinatar Arena in Murcia, which Spain won 4-1. An Ireland team composed predominantly of players from SSE Airtricity League clubs took the lead on the stroke of half-time when Cian Kelly of Bohemians finished off a brilliant counter attack. The hosts, managed by former Spanish international midfielder Julen Guerrero, started with a side that featured three players on the books at Barcelona, as well as two from Atletico Madrid. However, it was a Real Madrid player who brought Spain level. With 20 minutes remaining, substitute David Pecellin beat Aaron Maguire to score the equaliser. Spain converted all four of their efforts in the penalty shootout, with Tommy Fogarty the only Irish player to find the net. Nevertheless, it was a satisfying afternoon’s work according to Ireland head coach Jason Donohue. Ireland will play the Netherlands on Friday, before concluding the tournament against Hungary on Sunday. The Dutch were 2-0 winners in today’s meeting of those two sides. REPUBLIC OF IRELAND: Aaron Maguire (Tottenham Hotspur); Tommy Fogarty (Birmingham City), Ben Curtis (Shamrock Rovers — captain), Darragh Reilly (Sligo Rovers), John Ryan (Shamrock Rovers); Glory Nzingo (St Patrick’s Athletic), Luke McGlynn (Finn Harps), John Joe Power (Burton Albion); Conor Campbell (Finn Harps), Michael Leddy (Shamrock Rovers), Cian Kelly (Bohemians). Subs: Ben Quinn (Cherry Orchard) for Campbell (36), Evan Ferguson (Bohemians) for Power (44), Edwin Agbaje (Shamrock Rovers) for Kelly (44), Jamie Mullins (Bohemians) for McGlynn (50), Aaron O’Reilly (St Patrick’s Athletic) for Leddy (54). Email “Real Madrid youngster's equaliser costs Ireland U15s victory against Spain”. Feedback on “Real Madrid youngster's equaliser costs Ireland U15s victory against Spain”.